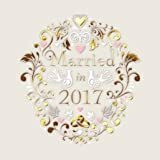 Greeting Card (PH2398) Wedding – Married In 2017 – From The Paper Gallery Range – Embossed Finish. A quality greeting card and envelope from the Paper Gallery range. The greeting inside this card reads: Congratulations. This card is supplied cello wrapped. The message on the front reads: Married In 2017. The Great British Card Company is a British Manufacturer of Quality Greeting Cards and includes collections such as Medici, Almanac and Paper House.